These books, however, are ones that genuinely made me laugh out loud repeatedly, and which I know have made others laugh as well. These books all come with a "Don't read on public transit or anywhere else people would be bothered by bursts of laughter" warning. There are very few in this category, both because I tend to read more serious stuff and because, as I said, what other people find funny I often find disturbing or sad. But it's worth making room in your reading rotation for funny books, as the benefits of laughter are well-documented. This book is awesome because not only will it make you crack up, but it also provides a fascinating look at how far the world of comedy has come in its attitudes toward female comedians. And it will make you want to be Tina Fey's best friend, if you don't already. Bossypants is Fey's memoir that is part hilarious and past inspirational, sometimes at the same time. In particular, she shares advice for women about not buying into the various messages thrown at us by others that are meant to make us be quiet, fill the roles we're given, and fit into other people's definitions. She also responds to criticism by saying things like, "To say I'm an overrated troll, when you have never even seen me guard a bridge, is patently unfair." In short: This book rocks and will also make you laugh hysterically. 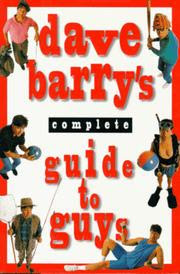 Some of Dave Barry's stuff I don't find funny at all, but for whatever reason, I find this book hilarious. In it, he attempts to explain why guys act like they do -- "guys" being a subset of adult men who have failed to mature in certain ways. I think I enjoy this book so much because of how often he draws on real-life examples (e.g., a biology textbook photo of a male toad looking "passionate" while attempting to mate with a human finger) and the fact that he breaks down ridiculous unspoken assumptions built into our culture, like how a guy should "take a look" at a broken-down car even if he's never looked at a car engine in his life (he explains that the guy will "take a look" anyway with the hope that the broken part will be waving a little flag saying, "Help me!"). You're bound to find at least one thing in this book that makes you laugh because of how much it rings true for you and the guys in your life. I read this at my aunt and uncle's house on Christmas, and everyone there wanted to know what I was reading because I could not stop laughing. 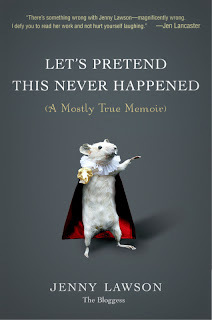 It's the memoir of Jenny Lawson, aka The Bloggess, whose blog I had actually never read before picking up this book. Mike, who rarely reads, insisted on reading it after me because he flipped it open and immediately started laughing at what he read. Seriously, I don't know what to say except that Lawson has a way with words that can make any situation hilarious, mostly by sharing every single thing going through her head. I've seen her writing compared to David Sedaris, which I can totally see, except I'm not a big fan of Sedaris and yet I loved this book. So either way: You should read it. What books have made you laugh out loud repeatedly? I think you in particular would love it because of your involvement in theatre! Definitely recommended. Bossypants was great, and I can't wait to read Jenny Lawson's book. In the same vein, I'd also recommend Caitlin Moran's How to Be a Woman, also a memoir and critique of various issues affecting women today - her very frank and decidedly British writing had me in stitches and pumping my fist by turns. Awesome! Thanks for the recommendation.